Sorry, the tables are not available for this display width. Please try viewing the page in landscape. Old Jutlandish II c.550 -c.640 Old Jutlandish and Old English spoken bilingually. Anglo-Jutish c.640 - c.730 Old Jutlandish displaced by Anglo-Jutish. Meon Old English c.730 - c.820 Anglo-Jutish displaced by Meonware Old English. Late Meonware after c.820 Jutish identity kept, but the Old English of Wessex spoken. The conjectured osmosis of Old Jutlandish blending with Old English, over a period of twelve notional generations, has been influenced by two main factors. The first being the commonality between English and Danish place names which survives today. The endings -sted/stead, -by and -ing, and the use of holm, are to be found in both kingdoms. The second factor is the Saxon character of most place names, in the Meon Valley and neighbouring areas, as recorded in Domesday Book. There are exceptions, of course, like Fareham. The conclusion above is also set against the supposed historical background discussed above. Namely, that while remaining conscious of their ancestry, the Jutes had come to identify with the West Saxon kingdom. As to their tribal government, apart from the authority of their hereditary chieftains, each settlement would have held thingsteads, or communal meetings, similar in function to the Saxon folkmoots. Unfortunately, we simply do not have enough evidence to try and reconstruct a theoretical list of minor Meonware kings. It might be suggested, perhaps, that the Jutes would have looked for regal protection from the West Saxon king in Winchester, a royal centre only some 15-20 miles away. 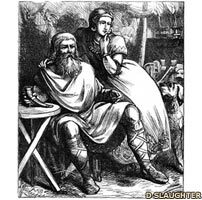 The Viking and his wife feasting, from Hans Andersen's story, the Marsh King's Daughter (the king probably derived from an underworld god). The Andersen tale describes the impact of the eastern Christ on the northern Odin, and also uses the time warp of Fairyland. There must have been similar circumstances amongst the Meonware of the seventh century.